The Alberta government is adding more than 400 new post-secondary tech program seats this September to keep pace with the province’s diversifying economy. 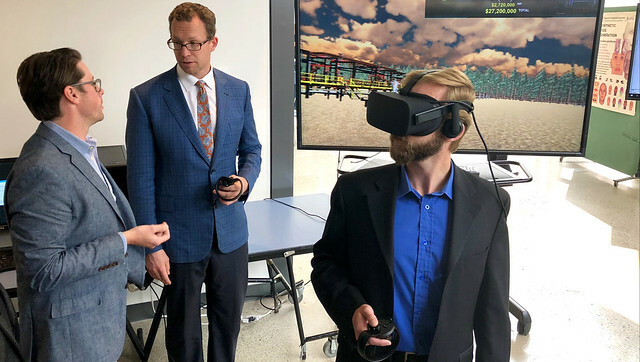 Minister Schmidt speaks with Trevor Phenix, vice-president of HIVE Innovations, while University of Calgary software engineering student, Jesse Fowler, demonstrates virtual reality goggles and software created by Vizworx. Working with post-secondary institutions in Edmonton, Calgary and Lethbridge, the province is helping more students access training opportunities that will lead to good jobs in Alberta’s growing tech sector. Most additional seats are being added to existing tech-related post-secondary programs that offer certificates, diploma or degrees and are one to two years in duration. Accepted programs also had high student and labour market demand. The additional seats are part of the government’s five-year, $50-million investment in growing Alberta’s tech sector. By 2023, at least 3,000 new tech-related seats will be added to post-secondary institutions across the province. The recently established Talent Advisory Council on Technology (TACT) will work with the tech industry, students, labour and post-secondary institutions to advise government on the best training opportunities to prepare Albertans for a more diversified and tech-savvy economy. Dru Marshall, provost and vice-president (academic), University of Calgary. The Growth and Diversification Act is part of the government’s commitment to create an economy built to last, and is an example of how the province is preparing Albertans for a more diversified economic future. Also included in the act are a number of tax credits to stimulate additional job creation in the tech sector. For the 2018-19 school year, 406 additional technology seats have been added at colleges and universities because of investments outlined in the Growth and Diversification Act. Post-secondary enrolment has increased in tech-related fields 8.4 per cent over four years.